When I was back in Indianapolis last fall for the ASHE (association for the study of higher education) conference, my friend Candice announced her pregnancy. This was a time of much rejoicing for us as we had been praying together for the Lord's blessing of a baby for her and Collin, among other things. So although it meant that Candice could not drink with us, she was an excellent chaperone, and we raised many toasts to her, Collin, and baby (for now called Jabar). I love making baby crafts. For some of my friends I make burb rags and bibs. 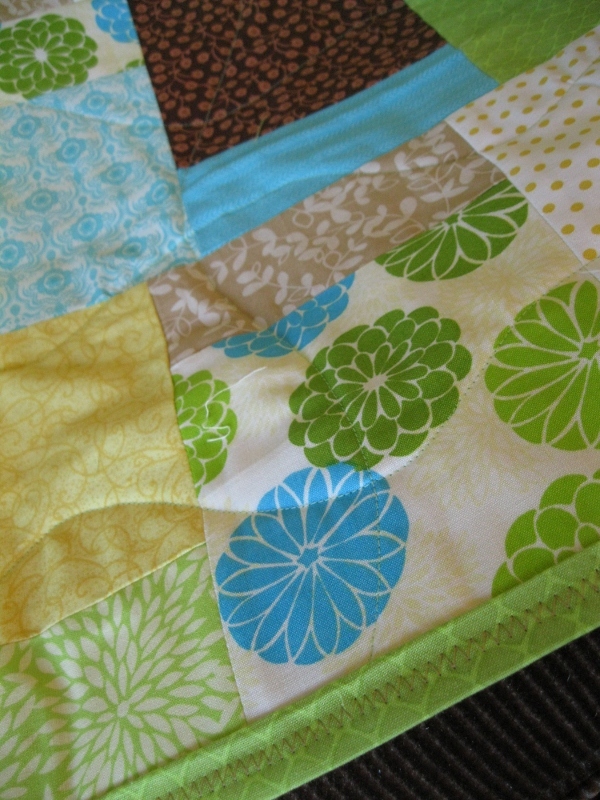 For others, I make baby quilts. I expect that for others, someday, I'll be making stuffed animals or baby clothes. Candice and Collin live in England, and will be living there for at least another year, maybe longer. This poses a huge problem for all of us, because we want to be able to meet the baby and love on him... alas, who knows when that will happen. 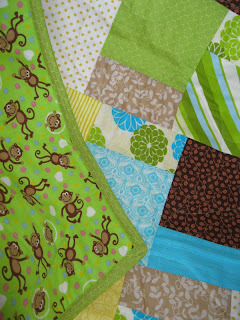 And so I decided that for the Bullards I would make a special gift of a baby quilt so that at least when they wrap up Jabar, its sort of like I'm there. I found this quilt kit at my favorite JoAnn Fabrics Super Store... which is like 25 miles north of me, in the valley. I thought the colors were great, but the patterns on the top were kind of classic and grown up - which I loved, but it didn't feel very "baby", so I was nervous. The backing fabric was a flannel brown gingham, not unattractive, but not baby at all! 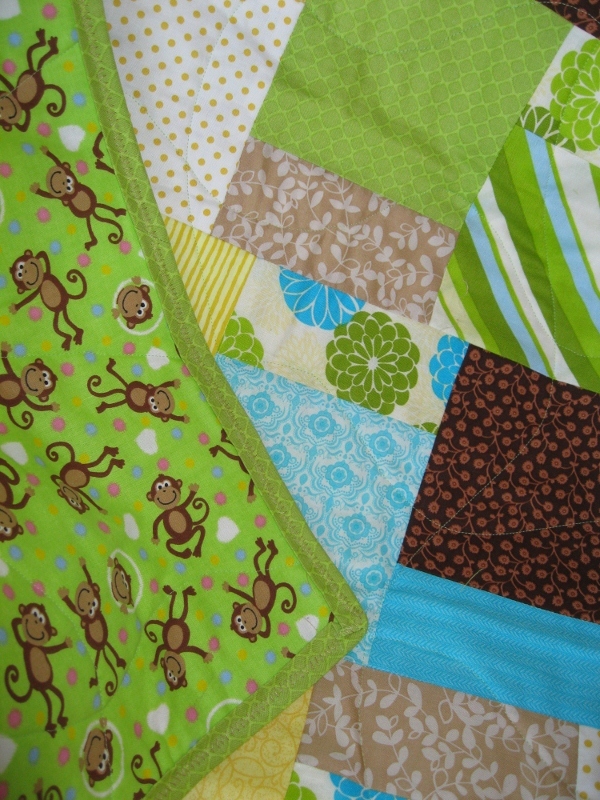 As I was wandering around the store, I found the perfect backing fabric..... bright green to coordinate with the colors/patterns on top, and monkeys all over it. For some reason, any baby of Collin's screams "MONKEY!" to me. Ultimately, I decided that this blanket would be perfect - the front is classic and classy - like Candice, the back is whimsical and funny - like Collin (actually both descriptions fit them both, but that is what I was thinking as I made it). I machine quilted the batting into the middle (previously, I had not included batting in the baby quilts, but since Jabar will be living in England, where it's cold a lot, I decided it needed the batting), and then cut and sewed on the blanket binding. This was also the first time I made blanket binding on my own. I was going to use premade binding, but because I was anxious to get it finished and I didn't have it on hand, I went ahead and made it... I was pretty proud of myself, actually, that I was able to figure out how to do it. 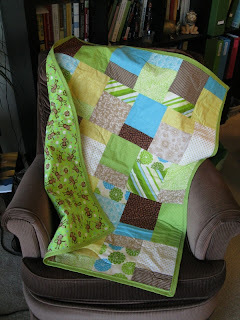 Now I think that I might just be willing to make binding again in the future! Well, enough about me and the process. 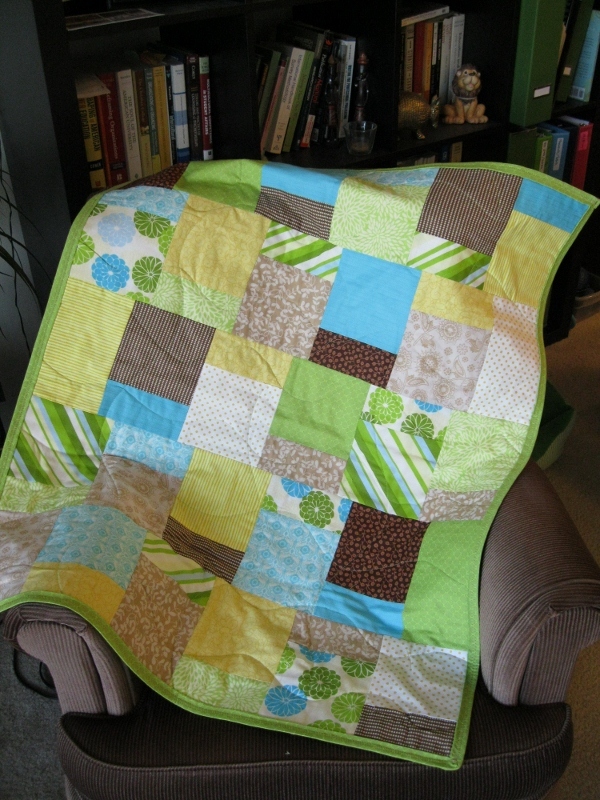 Here is the quilt! I'm so excited to be able to share it with you (It just arrived in Cambridge on Tuesday)!